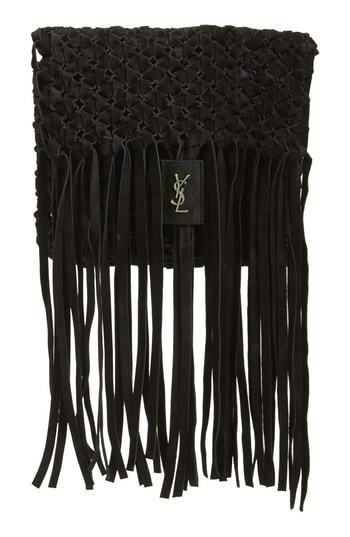 Try pairing a black leather biker jacket with a Saint Laurent fringed leather clutch to be both casual and knockout. When it comes to shoes, this ensemble is complemented nicely with white leather high top sneakers. Pair a black turtleneck with a black fringe suede clutch to get a laid-back yet stylish look. To add oomph to your outfit, complement with black embellished suede heeled sandals. 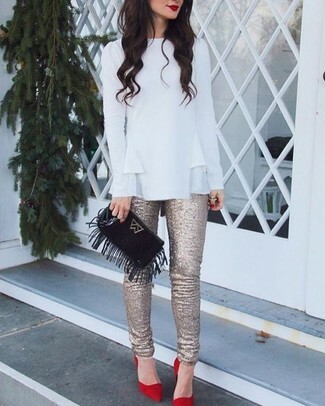 If you're obsessed with comfort dressing when it comes to fashion, you'll love this extra cute combination of a white ruffle long sleeve blouse and a black fringe suede clutch. You could perhaps get a little creative when it comes to footwear and dress up your ensemble with red suede pumps.